Last night there was a shooting at an off-campus student apartment community. My son happens to attend UNCG and lives in an off-campus apartment, but not in the community where the shooting occurred. Knowing that his parents might hear about it and might be concerned for his safety he sent me a text saying that a shooting had happened near his apartment, but that it wasn’t in his particular apartment community and that he was fine. We definitely appreciated it, but it also caused me to start monitoring the news about the shooting. As always I turned to Twitter because that tends to be where I get news the earliest, including from the various local news outlets, and sure enough that’s where all the freshest info was coming from. 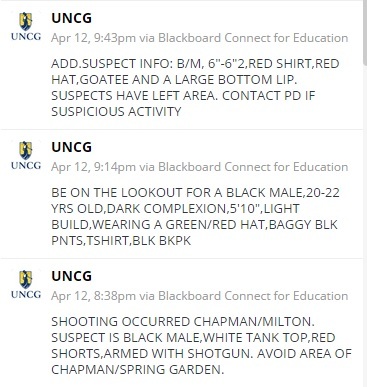 On behalf of the UNCG Police Department, I want to apologize for what many considered a racially insensitive description included in one of the alerts last night. We give our staff a great deal of latitude in crafting emergency messages because safety often depends on timeliness. Sometimes that means just repeating descriptions provided to us, as we did in this case. However, we know our community and should be able to filter information in a way that reflects our values but still provides the information you need to stay safe. One of our core values is Accountability, and, ultimately, I am the head of this agency, and I am accountable for the actions of those who serve you at the Police Department. For that reason, I apologize to those who were offended. We can do better, and we will. I truly can’t tell you anything about the department or the chief outside of this event because I haven’t had cause to pay any attention to them, but I can tell you that this is a very good response to a screw up that happened on his watch. It’s nice to see a leader accept the buck instead of passing it along. This entry was posted in Current Affairs, Greensboro, Leadership and tagged greensboro, leadership, police, uncg on April 13, 2015 by Jon Lowder.